Sad to say, but summer is coming to an end and the start of a new school year is just around the corner. That’s why we propose considering some school-related items as promotional gifts. 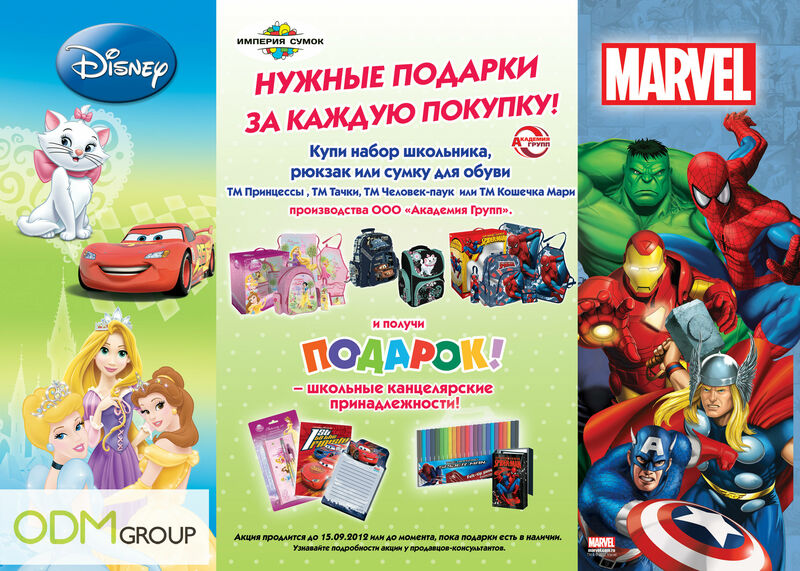 Have a look at this promotional campaign held in Russian Imperia Sumok stores selling bags and accessories. On buying school backpacks or shoe bags here, you will get some stationery for free! Thanks to the use of licensed characters from different cartoons, this offer will definitely be appealing to the kids. Children will beg their parents to buy some school items in Imperia Sumok stores! Август – горячая пора для родителей, ведь 1 сентября не за горами. Империя сумок выбрала замечательную маркетинговую стратегию – при покупке ранца или сумки для обуви Вы получаете школьные канцелярские принадлежности. Таким образом, Вам больше не надо будет беспокиться о покупке канцелярии.